I heard from my publisher last week, who had some positive news. They met as a committee and they like the book idea. Now what needs to happen is obtaining some numbers and reports on marketability, financial viability, and target audience, to see if it will work. I'll hear back in 3-4 weeks. 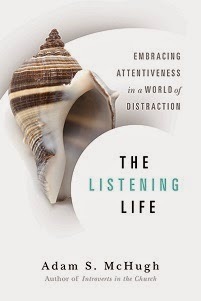 For those of you who are new to Introverted Church, I sent in a book proposal to a Christian publishing house back in June. Go here for the chapter outline of my idea. I always love feedback. I've had the opportunity to work with many extroverts in the last five years of full time ministry, with varying degrees of success. When I worked in a church, I had a very specific job description, which was very helpful. People didn't expect me to be the guy who worked 60 hours a week, caring for the entire congregation or leading the charge in evangelism. My least favorite environment, personality-wise, was the parachurch ministry I took part in, in which the leadership mold was decidedly extroverted and I was expected to be the lead socializer and the lead evangelist. It didn't help that my immediate supervisor was the most extroverted person I have ever met. As much as we tried to work out a job description for me that would play to my strengths, I still felt like I was constantly having to act like an extrovert. If I had stayed in that ministry and taken on a more supervisory role, I think I could have been happier, but the guy-on-the-front-lines role was not right for me. In my current position, I think I am developing a good partnership with the social worker on my team, who is definitely an extrovert. She has a great deal of energy and has much more output than I do on a weekly basis, but we have a mutual respect for what each other brings to the table. I'm the guy that can sit with a patient for two hours and listen to their life stories and help them discover a deeper sense of God and their own spirituality. She's more of the problem solver, who can refer them to any resources that they need. She is the person on the front lines who is great at introducing me to people who need chaplain visits. In other partnerships with extroverts, I have felt this external pressure to be more like them and to do more and produce more. This is the first "secular" job I have ever had. I wonder how much of my struggles in other arenas is related to evangelical theology and practice. My spiritual director said that "in the evangelical world, it seems that after you become a Christian, a giant neon billboard appears outside your window." There is this urgency to evangelicalism, which becomes all the more unappealing the older I get. In a recent Barna survey which studied pastors and their level of happiness, 24% of the pastors identified themselves as introverts, matching the numbers of the general population. However, introverted pastors were far more likely to report that they felt under-appreciated and isolated. Several therapists I know who frequently work with pastors said that many of their introverted clients struggle to find balance in their lives and often wrestle with depression. They feel unable to meet the social demands placed on them by their congregations, and they frequently lack adequate boundaries to enable them to find rest and to recharge their introverted batteries. 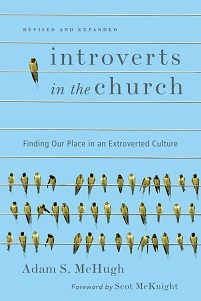 As a pastor I am encouraged that the percentage of introverted pastors reflects the percentage of introverts in the population, but I am troubled to learn that many introverted pastors feel discouraged. I have found that many churches expect the pastor not only to be a competent preacher and administrator, but also what I call the “Lead Socializer” in the congregation. One friend who was part of a pastor nominating committee told me about a conversation that a denominational executive once had with the committee. The executive said “If the pastor’s personality does not start with an ‘E’ then you need to keep looking.” As dismaying as that conversation is, it is all too common. Too many churches expect their pastor to be the first one on the church patio after the service and the last one to leave, meeting newcomers and renewing acquaintances with church members. All the interviews I have conducted with introverted pastors have yielded one commonality: the coffee hour after worship is their least favorite hour of the week. They love their people, but after expending a tremendous amount of emotional energy to preach, they would prefer to disappear into their offices than mingle.